This book is a long time in the making, I believe there were at least two earlier versions which were shelved. 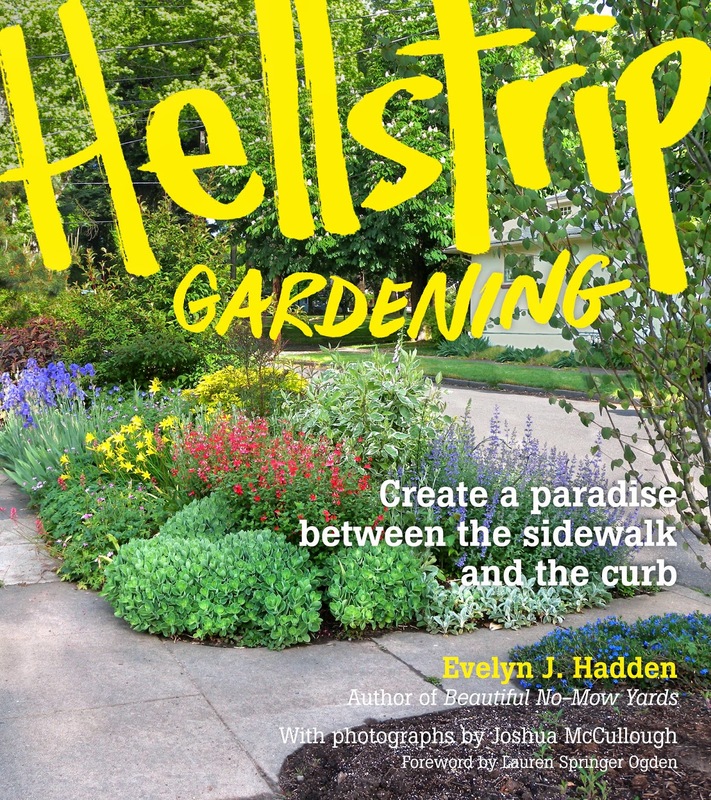 I eagerly anticipated them both and am happy to report that holding Hellstrip Gardening in my hands, reading the pages and devouring the photos, well, the wait was worth it. While I question why anyone needs a front lawn I do understand long held beliefs take a while to change. So I’m hopeful the “Lawn Gone!” movement will continue to gain momentum but I think this book is the perfect introduction to the concept. What is addressed as the “last frontier” (you’ve planted up everything else, why not focus on the hellstrip?) could actually be the gateway garden to an entire removal of front yard lawn. Just imagine! Who wouldn't want a hellstrip this beautiful? The first part of the book (Inspirations) shares 12 examples of “Curbside Gardens from Coast to Coast” each with luscious images and the story behind the garden. This section alone is worth the cost of the book! Laura has a great attitude doesn't she? This idea of public space is why I've only planted yuccas in my hellstrip (I inherited the two trees), they're plants that bite back! My part of town has very narrow parking strips, and there is a park at the end of the street, that means a lot of traffic and a lot of feet in my hellstrip. The yucca can take it. After you’re appropriately inspired by the first section Ms. Hadden covers “Challenges to Address, Obstacles to Overcome” (working with trees, laws and covenants, road maintenance and utilities, etc) and “Solutions for Designing, Building, and Managing a Curbside Garden.” Finally she wraps it all up with a listing of “Curbside-Worthy Plants” and suggests further reading. Are you curious? Well Timber Press has kindly agreed to give away a copy of Hellstrip Gardening to a lucky reader. If you’re interested simply comment on this post and let us know what you're doing with your hellstrip, I’ll chose a winner on July 6th and get in touch if you're the lucky one (I'll need to contact you to get your address, Timber will send the book directly to you). Also you’ll want to click on over to the Timber Press website because there you can enter to win a copy of the book (yes you need two, give one to a friend!) AND a $250 nursery gift card. Who can’t use 250 worth of plants!? Oh and if you’re one of the lucky bloggers coming to the Portland Fling you’ll get to meet the author when we visit the Timber Press offices next Friday morning! Timber Press sent me a complimentary review copy of Hellstrip Gardening but I was under no obligation to write about it. All photos (except for the book cover) in this post are mine and not from the book. All material © 2009-2014 by Loree Bohl for danger garden. Unauthorized reproduction prohibited and just plain rude. Yes Alan, I think you'd be pleased. Then again I did just skim that section. Those are some beautiful hellstrips. Mine has been planted for several years and there are yuccas and plenty of other tough plants in direct sun. We live on a curve at the bottom of the hill so the plants I use are inexpensive and commonly available because skateboarding teens were living up the street at the time. I also added a few boulders for speeders who might miss the turn late at night. This looks like a really interesting book. I'd love to have a copy, even though I don't have a helllstrip. We don't have sidewalks, but I do now have a long bed that runs along the street, and I bet this book would have useful suggestions for what to plant there. We get a lot of foot traffic, both two- and four-foot on our street because it's on the way to a school and a dog park. I've already had to deal with a peony flower disappearing from my front bed along the street, I'm sure there will be more. Unfortunately there probably will be more Alison. I won't share the details but a friend and I did a few things in our 20's that I'm not proud of, youth is a stupid time. That was part of the idea behind my yuccas, sadly those stupid trees are very thirsty! I'd love a copy even though, like Alison, I don't have a hellstrip. But the narrow beds along the sidewalk in our neighbor are our equivalents of hellstrips. Most people have boring shrubs or a few straggly lilies of the Nile, that sort of thing. I was going to do a count of lawn vs. "other" on my block and as others to do the same, but I forgot! Your narrow beds do sound similar. Very impressive hellstrips, including yours! The closest equivalent I have is an area in front of a hedge running along the street, which I've been planting up with succulents, including Agaves and Dyckia, in the hope that people will think twice before parking in front of it. No sidewalks in my neighborhood; my entire front lawn is a hellstrip. I'm with Mimo, no sidewalks around here and therefore no hellstrip, but I do appreciate these gorgeous examples! In both of your cases it sounds like your lawn is your hellstrip, it's all about gardening in the public eye. Nice work! So you're here in Portland? Yes - here in Portland. A great place to learn how to garden! Your blog has been such a great resource for learning about cool plants - thank you for the inspiration. No hellstrips around here Loree. I'm finding this info on who has "strips" and who doesn't very interesting! Even without a hellstrip one can take inspiration from those that were featured with their planting combinations, conditions, and so on. Wish we had one! My hellstrip is a steep slope that goes down to the sidewalk which then abuts the curb. The slope is planted with Texas sage (Cenizo), both the silver leaved and the green, drought tolerant natives that require sharp drainage, like Verbascum, white and pink prickly poppies, and other native wildflowers. It is never watered except by nature. There's a deer-made path that meanders between the Cenizos and the hogwire fence, and mama doe often leaves her fawn there while she goes off to forage by the creek. Many's the time I've encountered soft dark eyes looking into mine as I work the fence row inside. Ah Sandy this sounds beautiful, and then the bit about the soft dark eyes...sweet. OH my wonderful. I need to get that book. Actually I don't have a 'Hell Strip' we have no sidewalks in our neighborhood but I've begun to garden a strip along the street edge. Who needs all that lawn anyway? Thank you for doing a post on your blog, great shot of he foxgloves and it was nice to see a bit more of your garden. Looks like a great book and I'm especially impressed with Laura Crockett's attitude! My hell strip plantings began by my planting some trees in the existing lawn then I made a few beds between and finally just took over the whole thing. There was a plan for the first step and the second but then the strips became repositories for things that I didn't have space for inside my garden or those that I'd grown tired of. Now it's time to rip a lot out, rethink, and redo a lot. Oh well, there's always time, right? I love your hellstrips Peter, they are so jungley! (and that's a compliment). I like your post photos. My hellstrip is taking shape slowly, thanks to inspiration from Scott's Rhone Street Gardens. I tried to find a good shot of Scott's hellstrips but I couldn't. The amount of plants he's packed into narrow strips is very inspirational! Ya they're in the right of way here too and we don't own them. The city could come through and take it all out in a heartbeat. Kind of a scary thought. Never heard it called a "hell strip" before. That's a "nature strip" in my part of the world. Ours is covered in plants, with some mulched tracks, but I might have to try and emulate those "area rug" paved bits. They look fantastic. Wow "nature strip" sounds so much more healthy! Looks like a fun book. You've inspired me to find some hellstrips to photograph in my neighborhood. Ah David I wish you were coming to Portland too! We'll meet someday, maybe when the Fling comes back to Austin? Well, this is timely for me. I just ripped all the sod out of my parking strip and planted other stuff. Hopefully as it fills in it will look as good as the gardens here! Right now I think the neighbors are still wondering if I'm crazy, as it looks like a few little plants floating in a sea of gravel. Congrats! I bet they fill in faster than you think they will. Oh, such great ideas and lovely designs. I have done nothing with my hellstrip (other than plop in some ever-spreading native snowberry) because I can't think of anything that can survive trampling by my dear resident basketball players and their rebounding ball. I look forward to an attractive planting there some day. Even so, I suspect the benefits of the expanding garden will be a small consolation for the emptying nest. Yes I briefly considered putting a dense planting in my parking strip (since that is my planting style!) but then quickly realized with all the soccer feet that would be a big mistake. I just read Evelyn's book (so don't enter me in the giveaway) and enjoyed your take on it. Yes to curbside gardening -- that tends to be where I start first just because it's so inhospitable to grass. BTW, thanks so much for the Lawn Gone link love! Happy to mention your great book whenever I can Pam! R. insisted on planting English ivy in our hellstrip in town, but I'm pretty sure he is a reformed character. Tough, tenacious stuff that it is, replacing it will be a challenge. Yikes! I wish you luck with that. I am very intrigued by this book. Just bought a corner lot house (in the outlaw neighborhood who I really should go meet) with 15 foot wide hellstrips. They are currently populated with an adolescent oak, a horribly pruned holly, and very weedy grass. A little intimidated by the project, but I am excited for the challenge. Hopefully my new neighbors enjoy the garden and don't let their dogs trample all over it or steal the flower or plants for that matter. I had an old neighbor who use to plant in a traffic circle but gave up because people kept on steeling the plants. Yes indeed you should introduce yourself to the outlaw! One of the nicest people people you could meet. As for trampling dogs I think that will be a problem no matter how much people love what you do. I've watched big dogs run off leash up the street in and out of every yard and garden and their owners are oblivious. Some people! Woweee! I never win anything ever--and especially never have I imagined winning something this cool! Although I am without a hell strip, I shall soak up the inspiration and helpful tips gleaned from this awesome book. Thank you so much! I'm a bit ashamed, because I didn't even know it was called a "hellstrip". I've helped many people clear up their curbside strips, though! :) It's an amazing place for decorative and semi-tall plants. Some of my clients were even lucky enough to have enough space to make their own natural barricades (against the cruel outside world). I deeply envy them.